Home > Products > Yaah! 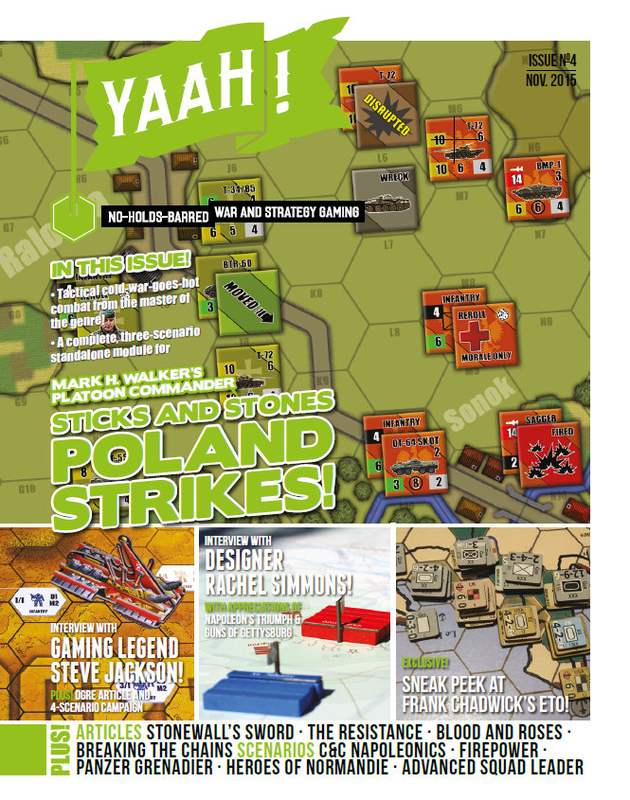 Full-color non-ASL magazine with wargame(s) included, available in printed or downloadable form. Occasional ASL scenario. Yaah! magazine is both the title of the wargaming magazine published by Flying Pig Games and the name that publisher Mark H. Walker gives to his night terrors. Flying Pig Games, which began operation in late 2014, was the new game publishing venture by Walker, who had previously owned Lock ‘n Load Publishing (LNLP). Walker sold LNLP in 2013, staying on as a designer, then after a falling out with the new owner, severed all ties with the company in 2014. Lock ‘n Load Publishing had been responsible for the game Lock ‘n Load, a tactical wargame that borrowed from ASL. Shortly thereafter, Walker began Flying Pig Games. Yaah! 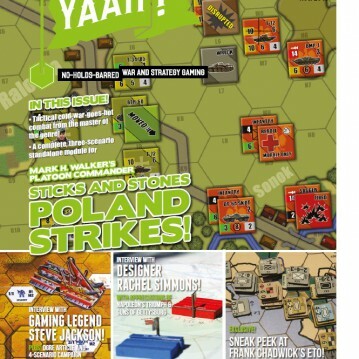 is a general wargaming magazine that seems to deliberately emulate the French magazine Battles in look and content. 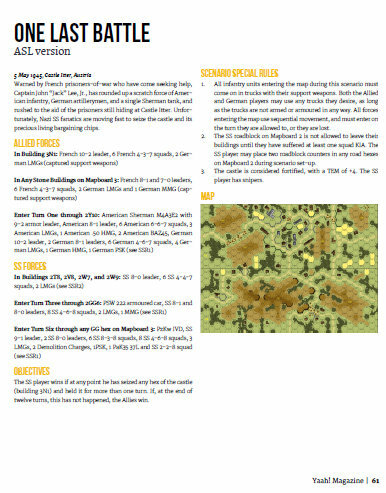 It features reviews and articles about various wargames, a small wargame with every issue, and scenarios for wargames and miniatures. In Yaah! #4, published in 2015, it included an ASL scenario, which may portend future ASL scenarios in future issues. However, the scenario published in Yaah! #4 does not bode well for ASL fans. With SSRs such as “The SS player has snipers,” it does not appear as if the author of the scenario actually plays ASL (though he may have played Squad Leader). The scenario itself has various rules and other issues, such as the American player getting 3 LMGs. Moreover, it doesn’t seem to have been playtested, as it provides the American player with serious ways to abuse the scenario. The scenario also doesn’t seem to even remotely match the historical action. Yaah! #5 debuted in February 2016, featuring two more ASL scenarios, both set during the Battle of the Bulge and both entries in a general (i.e., any game system) “scenario design contest” sponsored by Yaah!. 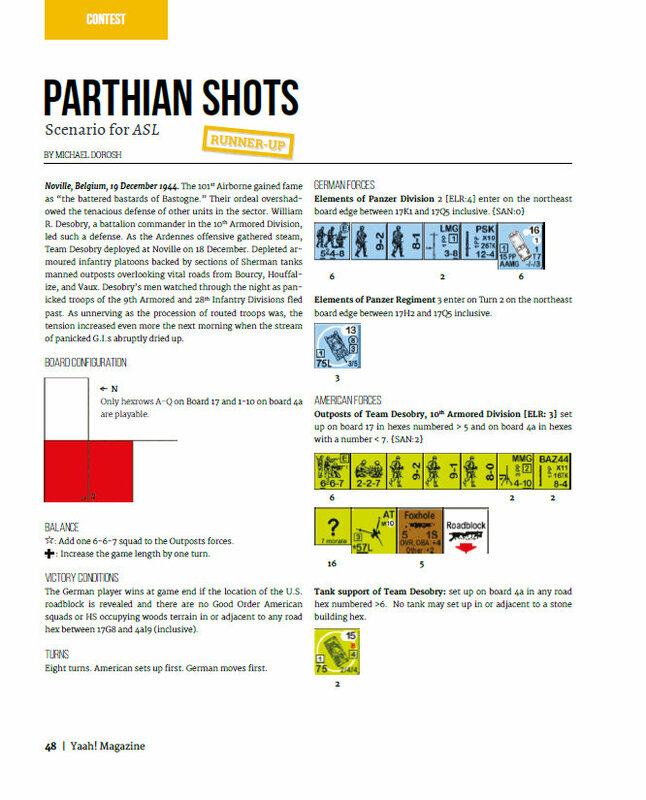 One of these scenarios is (no numeric designation, so by default should probably be considered Yaah-2) “Parthian Shots,” designed by novice Canadian ASL player and designer Michael Dorosh. The other is Yaah-3 (Spirited Defense), designed by experienced Canadian ASL player and designer George Kelln. Unlike the designer of the scenario in Yaah #4, both of these designers at least know how to play ASL and know what elements (ELR, SAN, etc.) are needed in an ASL scenario, although the Dorosh scenario does use non-standard language (such as “occupying woods terrain” and “enter on the northeast board edge”). Even by its second issue featuring ASL scenarios, Yaah! has still not established an ASL scenario design as other magazines (such as Vae Victis and Battles) have. Not only are both scenarios different in appearance from the Yaah #4 ASL scenario, they are different in appearance from each other as well. The Dorosh scenario seems to use old VASL graphics. It has an SSR that says that an originals doubles DR on a tank MA hit using Area target type, or while firing vehicular MG loses ROF, but tanks don’t get ROF for their MG or when using Area target type. It is not clear that this scenario was playtested prior to submission and it is certainly doubtful that Yaah! itself had the scenario playtested and developed. The Kelln scenario does not use VASL graphics, it uses the graphics Kelln (the proprietor of Lone Canuck Productions) uses for his own products, though for some reason it does not also feature his layout. His scenario uses (among other geoboards), ASLSK board t. It uses standard ASL language, which one would expect for someone who has designed as many scenarios as Kelln has. It is not clear what playtesting this scenario got as well. An ASL novice apparently played both (solitaire?) and provided a paragraph of commentary on each. Unless Yaah! creates a consistent, solid graphic design for its ASL scenarios and takes efforts to insure that ASL scenarios that it publishes are fully playtested (and to assure readers of such), there may be no reason for ASLers to get this magazine for its ASL content.